Located southwest of Anchorage along the Alaska Peninsula, the Lake and Peninsula Borough encompasses approximately 23,782 square miles of land (roughly the size of West Virginia) and 7,125 square miles of water. Extending 400 miles from Lake Clark in the north to Ivanof Bay in the south, it contains three National Parks (Lake Clark Nat'l Park & Preserve, Katmai Nat'l Park & Preserve, and Aniakchak Nat'l Monument & Preserve); two National Wildlife Refuges (Becharof Nat'l Wildlife Refuge and Alaska Peninsula Nat'l Wildlife Refuge); and numerous designated Wild and Scenic Rivers and State Critical Habitat Areas. The Lake and Peninsula Borough is geographically and ecologically diverse. It is bordered on the west by Bristol Bay and on the east by the Pacific Ocean. 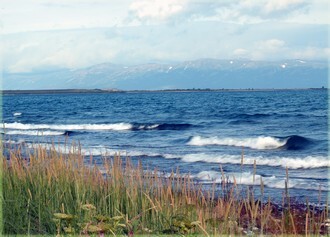 The Bristol Bay coast is comprised of low lying wetlands and the rugged Pacific coast is dominated by numerous volcanoes of the Aleutian Range, which runs the length of the Borough from Lake Clark to Ivanof Bay. Iliamna Lake, located in the north, is the largest freshwater lake in Alaska and the second largest in the United States. Iliamna Lake is home to one of only two colonies of freshwater seals in the world. These lakes provide nurseries to the largest red salmon runs in the world. The Lake and Peninsula Borough provides large amounts of high quality habitat that support a phenomenal amount of flora and fauna. The Bristol Bay region is recognized as a world leader in salmon productivity. Commercial fishing, sport fishing, hunting, bear viewing, recreation and Adventure tourism, and subsistence are important economic activities that rely on the bounty of the Borough's landscape. Salmon spawning streams attract some of the largest concentrations of brown bear in Alaska. Approximately 10,000 brown bears populate the region, making them more numerous than people. Abundant moose and caribou inhabit the region. Other mammals include wolves, wolverines, river otters, red fox, and beaver. Sea otters, sea lions, harbor seals and migratory whales inhabit the shoreline and offshore waters. Coastal estuaries are home to waterfowl while nesting eagles, peregrine falcons,and thousands of seabirds inhabit the sea cliffs. Commercial fishing and fish processing are the most significant sectors of the economy within the Borough, which contains three of the State's most important salmon fishing districts: Egegik, Pilot Point and Ugashik on Bristol Bay, and Chignik on the Pacific coast. The majority of Borough residents rely upon commercial fishing as a primary source of cash income. Seven shore-based processors and numerous floating processors operate within Borough boundaries, generally importing their workforce. Tourism and recreational activities are the second most important industries in the Borough, and are rapidly increasing in economic importance. The Borough contains over 150 hunting and fishing lodges. Approximately 350 Professional guides are registered to operate within Borough boundaries. The area experiences a transitional climate. Average summer temperatures range from 42 to 62 degrees fahrenheit; winter temperatures range from 6 to 30 degrees fahrenheit. Annual precipitation is 24 inches, with 54 inches of snow.